As our boat motored down a shallow, brown canal, the sound of the motor sent the residents of Tram Chim National Park scattering. Birds—many hundreds of them—were roused from their forest perches by our intrusion on an otherwise peaceful, overcast morning. I’m not a birder, so my visual description of them is limited to “brown,” “bluish,” and “black-and-white-spotted.” But Tram Chim, located in Vietnam’s Mekong River delta, is home to at least 231 different species. That includes a number of rare birds, such as the elegant, red-headed sarus crane, which is native to southeast Asia. A hot spot for the crane, Tram Chim is lush with its preferred food, the Eleocharis dulcis, a green shoot attached to what humans know as the “water chestnut.” The park is also one of the last preserved places in the flat, expansive wetland known as the Plain of Reeds. Later this month, Tram Chim will be officially named a “Wetlands of International Importance” under the Ramsar Convention. Ramsar—an international treaty named after the city in Iran where the convention was adopted in 1971—is used to honor wetland ecosystems that have maintained their “ecological character” through sustainable management. Its listing was announced in February, but will be officially recognized at a ceremony later in May. 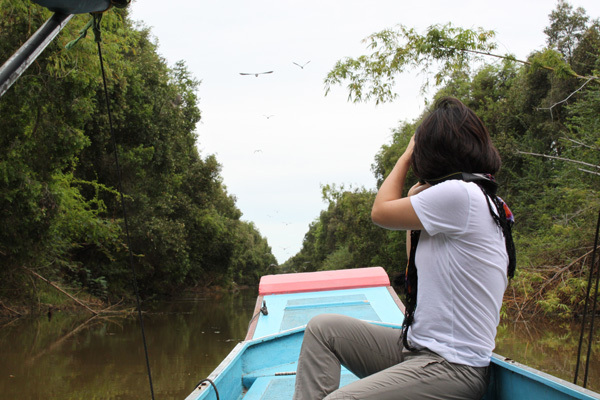 It is the world’s two thousandth Ramsar site and the fourth in Vietnam. The recognition comes out of the work of an unlikely partnership between Tram Chim, local government officials, the World Wildlife Fund, and Coca-Cola. That last one might seem a little out of place. 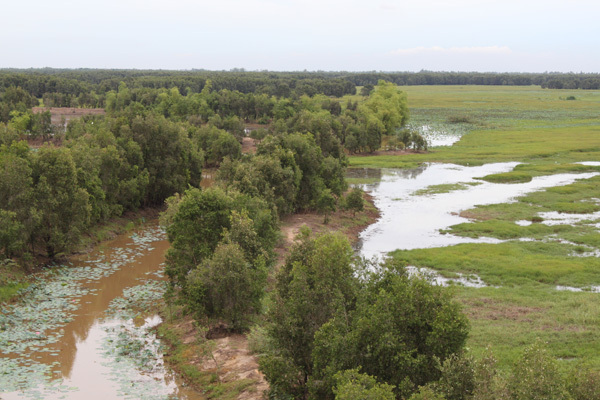 But Coke has been very involved in funding conservation work with seven major rivers around the world, including here on the Mekong, through a partnership with WWF that began in 2008. The park is located between two of the Mekong’s nine branches, with a number of small canals and small waterways leading through the park that feed the wetlands. The lush park can be covered in two to three meters of water during the wet season. But the low grasslands are prone to fires during the dry season of March through May. To prevent those fires, the local government built up the dike system in the park to trap the natural flows of water, keeping the grassland drenched throughout the year. But that, they soon realized, was bad for biodiversity in the park. It was killing off the grasses that the cranes like to munch on, so fewer of them were coming to the park. 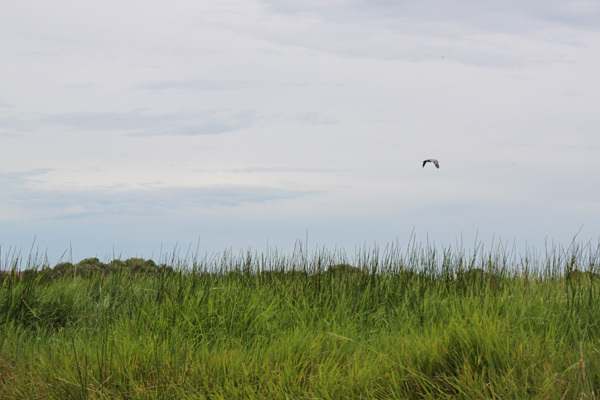 Working with park officials and scientists, WWF helped devise a new water management plan for the park, one that monitored water levels more closely and adjusted the dike system so that it could return to a more natural flow, restoring seasonal changes in the park. The new plan has helped them restore the habitat in the park, while still preventing fires, and has been adopted by the provincial government. WWF Vietnam’s work in the park—and in the Mekong Delta more broadly—has been supported by Coca-Cola’s Global Water Stewardship program. Over the course of the partnership, Coke has provided $4.1 million in funding for WWF’s Mekong work, and funded similar efforts on six other river basins around the world. But why? Coke’s Director of Global Water Stewardship, Greg Koch, is quick to point out that their reasons aren’t entirely altruistic—even though he gets excited when he talks about the birds of Tram Chim. For Coke, the health of freshwater sources is crucial to their business. Coke has a presence in all but three countries around the world. (Only North Korea, Cuba, and Burma are Coke-free.) Anyone who has traveled to remote corners of the world has probably been surprised to find Coke pretty much everywhere, and most of that comes via more than 1,000 local bottlers around the world who also depend on the availability of clean, healthy, local water. In Vietnam, they have three bottling facilities in Hanoi, Ho Chi Minh City, and Da Nang. “It’s not a reputational driver to do this type of work. We do this because it’s critically imperative to our business,” Koch said. Their brand recognition has also helped draw the attract attention for conservation work from local and national officials in places like Vietnam. “It’s one thing when WWF goes in and says this is important,” Koch said. “It’s another thing when Coca-Cola and WWF come in and say it’s important to both of us, because it changes their perspective.” While Coke isn’t using water directly from the Mekong, Koch said the company is interested in working to preserve the water freshwater sources that are locally relevant—and in the case of Vietnam, the Mekong is king. 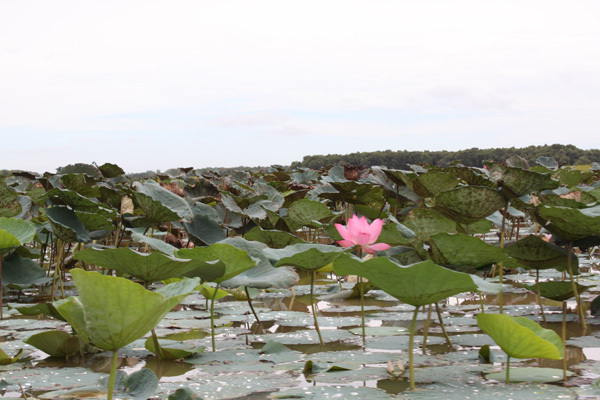 But then the motor kicks back up again, so we can navigate back through the floating lotuses to the park headquarters. Once again, the birds are stirred to flight, taking off to quieter reserves.